Palestinian amora of the third century, although his father's name suggests a Babylonian origin. He transmitted the sayings of Joshua ben Levi, Johanan, and Bar Ḳappara. 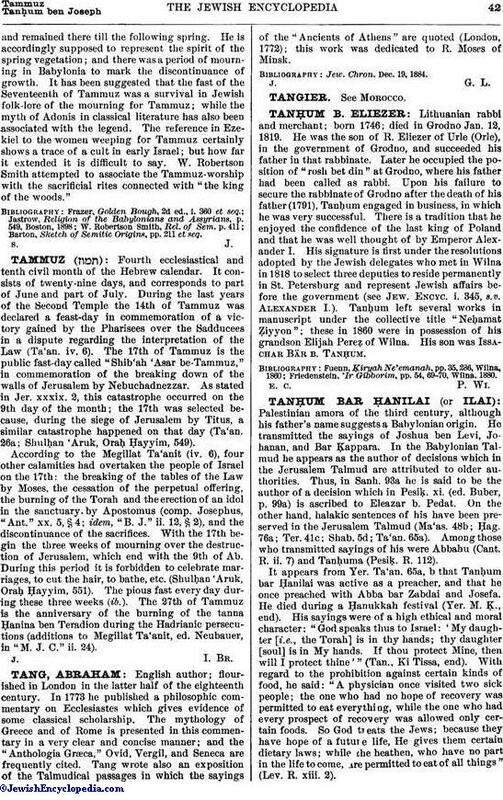 In the Babylonian Talmud he appears as the author of decisions which in the Jerusalem Talmud are attributed to older authorities. Thus, in Sanh. 93a he is said to be the author of a decision which in Pesiḳ. xi. (ed. Buber, p. 99a) is ascribed to Eleazar b. Pedat. On the other hand, halakic sentences of his have been preserved in the Jerusalem Talmud (Ma'as. 48b; Ḥag. 76a; Ter. 41c; Shab. 5d; Ta'an. 65a). Among those who transmitted sayings of his were Abbahu (Cant. R. ii. 7) and Tanḥuma (Pesiḳ. R. 112). It appears from Yer. Ta'an. 65a, b that Tanḥum bar Ḥanilai was active as a preacher, and that he once preached with Abba bar Zabdai and Josefa. He died during a Ḥanukkah festival (Yer. M. Ḳ., end). His sayings were of a high ethical and moral character: "God speaks thus to Israel: 'My daughter [i.e., the Torah] is in thy hands; thy daughter [soul] is in My hands. If thou protect Mine, then will I protect thine'" (Tan., Ki Tissa, end). With regard to the prohibition against certain kinds of food, he said: "A physician once visited two sick people; the one who had no hope of recovery was permitted to eat everything, while the one who had every prospect of recovery was allowed only certain foods. So God treats the Jews; because they have hope of a future life, He gives them certain dietary laws; while the heathen, who have no part in the life to come, are permitted to eat of all things" (Lev. R. xiii. 2). Tanḥum bar Ḥanilai's haggadah is especially characteristic because of his system of connecting the last words of one Bible paragraph with the opening words of the next, as Lev. i. 16 with ii. 1 (Lev. R. iii. 4), Lev. xii. 2 et seq. with xiii. 2 et seq. (Lev. R. xv. 5), Ps. xciv. 1 with xciii. 5 (Midr. Teh. ad loc. ), and Num. v. 12 et seq. with v. 2 et seq. (Num. R. ix. 4). Haggadic sayings of his are quoted in the following places: Sanh. 7a, 100a; 'Ab. Zarah 18b, 19b; B. M. 86b; Shab. 22a; Ḥag. 7a; Ber. 8b, 13b; Meg. 15b; Mak. 10a; Yer. Ta'an. 68c; Gen. R. iv. 6, xci., beginning; Pesiḳ. R. 21, end; Ex. R. xlii., end; and Lev. R. xxvi. 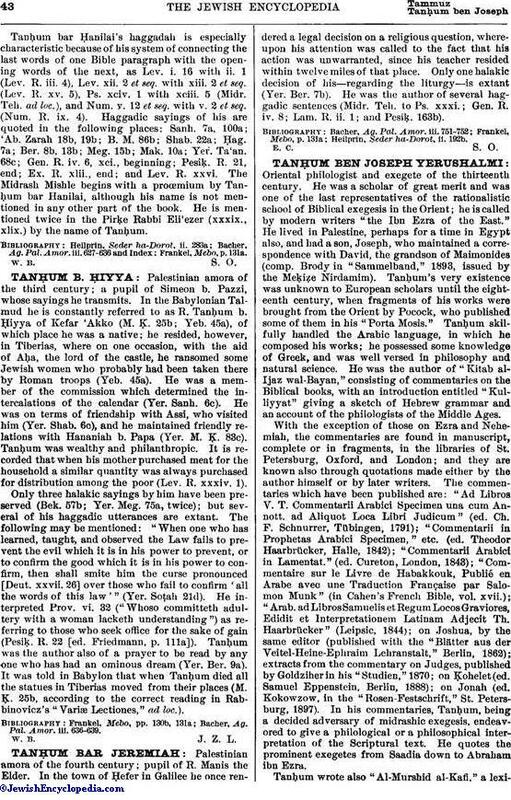 The Midrash Mishle begins with a proœmium by Tanḥum bar Hanilai, although his name is not mentioned in any other part of the book. He is mentioned twice in the Pirḳe Rabbi Eli'ezer (xxxix., xlix.) by the name of Tanḥum.